STOCKROUTE: Breaks in all swells with W-NW offshores from 1 to 8 ft. Variable left and right-hand beach break. Usually fast and hollow. SCHOOL: Similar to Stockroute. Easy access from Wairere Road opposite Wainui School. PINES: Describes middle section of Wainui by the surf club. Variable right and left-hand peaks. Also popular with swimmers, clubbies and boogy boarders. Consistently good surf in all swells with W-NW offshores. Often hollow. 1 to 8 ft. Easy access from surf club car park or Lysnar Domain picnic area. THE CHALET: Similar to Pines further north along Wainui. Easy access from car park, picnic spot off the highway. LONE PINE: Beach break between Chalet and Whales. 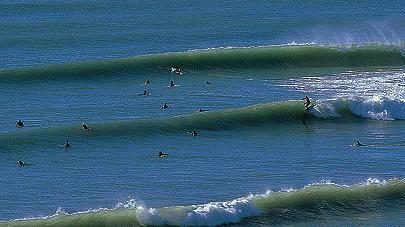 Variable beach break, lefts and rights. Depends on state of local sandbanks. WHALES: General name for northern end of Wainui in vicinity of Sperm Whale Grave. Variable beach break, similar to rest of Wainui. MAKORORI POINT: Favourite right-hand point break. NW-W offshores in all swells, best from NE. Best at mid to high tide. Usually long, gentle walls, but can be fast and challenging in optimum conditions. Medium to long paddle. Popular with longboarders. 2 to 6 ft.
RED BUS: Fast breaking lefts and rights on reef next to Centrebreak. Breaks all swells with NW-W offshores. Best mid to high tide. THE CREEK: Fast right-hander breaking on reef into sandy channel. South swells with NW winds. 2 to 6 ft.
MAKORORI REEF: Seldom surfed, very fast reef break. 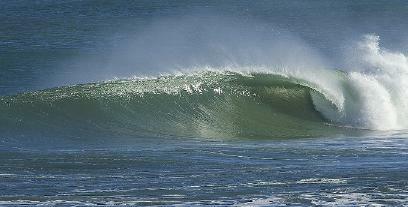 Breaks best in very large south swells with offshore from NE.